When you invest in a tablet for your child, you worry. Will the tablet break? Will your child be exposed to inappropriate content or outgrow the tablet? Will you get into battles when it’s time to turn the tablet off? With the Fire HD Kids Edition tablet, Amazon addresses each of these concerns. Let’s face it, sometimes accidents happen. That’s why the Fire HD Kids Edition tablet comes with a 2-year worry-free guarantee. That means if anything happens, you can send the device back and they’ll replace it for free – no questions asked. 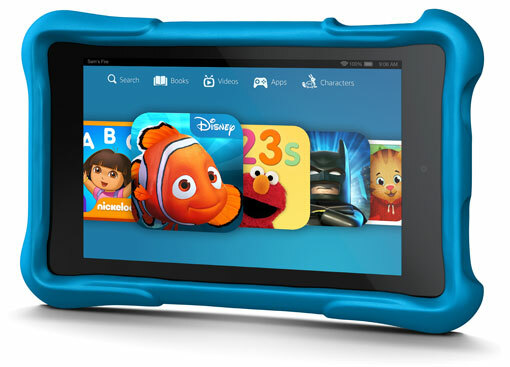 The Fire HD Kids Edition tablet isn’t a stripped down version of the Fire HD tablet. It’s a full Fire HD with a quad-core processor, a vivid HD display and front- and rear-facing cameras. With the Fire HD Kids Edition, you also get a removable, drop-proof case, parental control software and access to 5,000 child-friendly books, movies, TV episodes, educational apps, and games, with a free 1-year subscription for Amazon FreeTime Unlimited. Your child won’t outgrow the tablet because it can run any app in the Amazon Appstore. 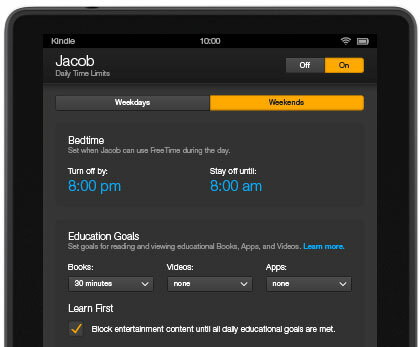 The only limits are those you choose to set with AmazonFreeTime Unlimited and you can adjust them as your child matures. And the case? It’s easily swapped out for a more fashionable design when your child gets older, or removed entirely. What about screen time? Again, you’re in the driver’s seat with the FreeTime app. You set up a profile for your child and choose how much time he or she can spend on the device on weekdays and weekends. You can also set specific times when the device can be used. So if you only want your child using the tablet after school and until 5PM, you can do that. Amazon also lets you set limits by type of content. For instance, you can set up the device for unlimited reading, but only 30 minutes for games and an hour for videos. And if you want your child to read for a set amount of time before engaging in other activities, you can do that too. Better yet, the device will time out with a message “All done for today!” when the time limit or time of day is reached. You don’t have to do a thing. The Amazon Fire HD Kids Edition costs $149 for the 6-inch model and $189 for the 7-inch model. Both come with a choice of blue, green or pink case. For more information, visit www.amazon.com/kids-edition-tablet.